To be able to adjust your bed just like the Ultimaker 2 is doing you have basically 2 options: - Home Z at the bottom, you will need place your Z end-stop at the bottom - Home Z at the top using a sensor instead of the home switch in order to be able to home lower than Z0 For the first solution look at the following Youmagine mod by NeoTko: https://www.youmagine.com/designs/new-z-endstop-limit-location-for-calibration-a-la-um2-on-umo This design focuses on the second option: using a sensor for Z homing. More information about the setup and the firmware (https://bultimaker.bulles.eu/experimental/): https://www.youtube.com/watch?v=cqELGTssb6M You can also check the following thread on the Ultimaker _community_: https://ultimaker.com/en/community/22120-idea-new-location-for-z-limit-on-umo ### About the sensor I am using a SN04 PNP inductive proximity sensor. 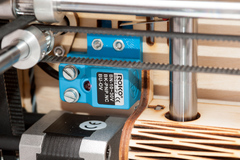 These sensors are inexpensive and accurate -- Homing is accurate at 0,01mm: https://www.youtube.com/watch?v=OHYSASlbN_8 You can use the simple holder posted in this design to secure the sensor in the holes of the second extruder. The sensor will trigger accurately on the top screw of the bed cap, but __you need to add a metallic tape__ under the screw to ensure that the sensor will continue to trigger past the screw! (see picture) Note that I am leaving the original end-stop switch in place as safety measure. In any case the bed won't crash in the hot end. #### Normally open or closed? These sensors are typically available in 2 flavors: Normally Open (NO) or Normally Closed (NC). The Ultimaker switch operates as an NO switch. If you use an NO sensor, you can cable it in parallel with the switch. If you decide to use a NC sensor, "re-cable" the Ultimaker switch in NC (see picture) use both in series, and re-configure the firmware. From an electrical standpoint, these sensors typically run with a voltage between 12 and 30v, the higher the better. You can easily source the 24v (or 19v) from the 'always on' fan output (see picture). Be careful, you cannot inject the sensor signal directly into to the AVR microprocessor, use an octocoupler to separate electrically the sensor and your UtliBoard. For the sake of clarity I have indicated the polarity in the pictures.